We mentioned London-based Australian artist James Cochran aka Jimmy C earlier this month when the artist had his first London solo show presented by No Way Art on Red Church Street. 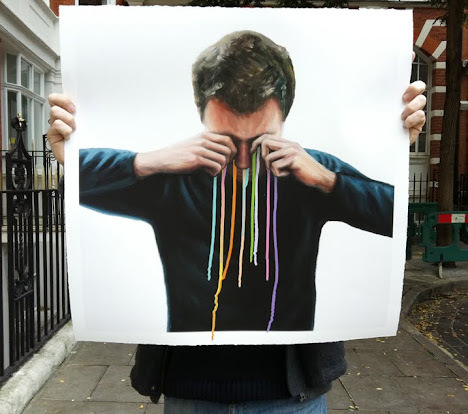 The opening night also marked the release of the artist's first screen printed Edition 'The Artist's Tears'. The edition is now being available online this Friday 25th Novemebr and will be available in two amazing colourways - Pastel and Bright. We have been told a lot of love has gone into these editions; James has hand sprayed the tears on every print, so they're all truly unique. Edition size is 25 each, 64 x 64cm on 315gsm Innova Smooth Cotton High White paper - with a deckled edge. They also come signed and numbered by the artist, priced at a £165. The prints will be available online from Friday here.